What is it like to live with the knowledge that any moment missiles might rain down on you? To understand this is to understand the situation in Southern Israel that led to Israel’s operation against Hamas. On Tuesday morning, as I was getting ready to leave my home, a woman’s voice said “Tzeva Adom! Tzeva Adom! Tzeva Adom!” over Sderot’s public speaker system. I had already heard this alarm a few times that morning, and several hundred times since I moved to Sderot. It meant that a rocket fired by Hamas in Gaza would explode somewhere in or near Sderot in about fifteen seconds. I went about my business, turning off my computer and packing my books, as I awaited the explosion. When the inevitable happened, I heard that unmistakable cracking sound at the tiny fraction of an instant, the KA of the KABOOM! It indicated that Hamas had been lucky this time and hit somebody’s home, instead of their rockets landing in a field whose mud muffled the blast. One learns to pick up these subtle differences in kinds of explosion if one lives in Sderot. Less subtle was that my building shuddered, and my windows danced in their frames; I felt the slight shove of the shockwave going through my body. I knew that this Kassam rocket had landed within a few blocks of my home. The missile, as you will read, hits the building across the alley. Reporter’s life becomes part of the story. Prosper Peretz owns the Peretz Shefa Market on this street, Mivtza Sinai (the street hit by the missile). His shop stood immediately opposite the home that was hit, and he surveyed the scene from the sidewalk in front of his foodstore. I often shopped in his little store, which his parents had founded. He lived above the shop with his wife and children, all of whom help run the family business. I asked Peretz if he had been present when the rocket exploded. A calm and soft-spoken man, who spent much of his life in army uniform, he nodded his head. I asked about damage on his side of the street. He pointed to blown-out windows above his shop. Peretz was polite, but evidently not in a communicative mood today. I walked inside to greet Peretz’s daughter and to buy a chocolate bar. I asked her about her experience of the bombing. She told me she had been upstairs when the rocket hit her neighbor’s home across the street, but that she ran downstairs just in time to see her father taking care of “the one who was wounded.” My eyebrows went up. “What’s that?”, I asked. She told me she ran downstairs and saw her father bandaging a bleeding man who was lying on the sidewalk outside their shop. Prosper Peretz, a man with the calm, humble demeanor of the professional soldier, had told me none of that. I went out to ask him what he did. He smiled slightly and told me that one of the sons of the family whose house had been hit had been walking down the street, either to or from home, when the alarm went off. Hearing the recording, he tried to run into the Peretz Shefa Market, but he did not run fast enough. The man had received two shrapnel wounds, one of which made a gash on his cheek. The second piece of metal opened the artery on the left side of the young man’s neck. Blood being pumped up to his brain was squirting out in bursts, each burst in accordance with the heart beat that sent the blood in the direction of his brain. The young man would clearly have bled to death soon had Peretz not taken action. His daughter walked downstairs to the sidewalk to see her father saving a life. She went into their shop to call an ambulance. This ambulance had left just a minute or two before I arrived, carrying the man whose life Prosper Peretz had saved. “I see”, I said. Peretz told me he was able to do that because of the good training he had received in the army. “And by the way, why are you wearing a mere undershirt on a cold and rainy day?” I asked him “I used my shirt on the guy’s neck.” I pointed to what I now understood to be bloodstains on Peretz’s undershirt, and he just nodded his head – “It happens here.” I stood there trying to think of a way to express my admiration for someone who had just saved a life, but who had no wish to display that fact, when the alarm sounded. How does one live a life when this is the reality? To face that question is to face the reasons behind Israel’s operation against Hamas. 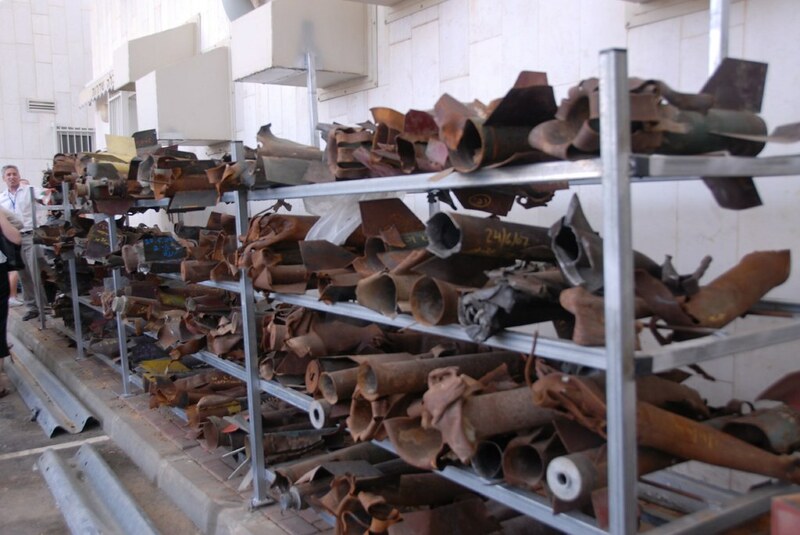 Make sure to click over to the blog, Living with Rockets, to read more about the situation under which Southern Israel did and does live.